How to watch DVD movies on BlackBerry Z10? BlackBerry (formerly Research in Motion) introduced BlackBerry Z10 on 31st, January, which runs the company's latest operating system: BlackBerry 10 OS. This device with a professional-looking offers a 1.5GHz Qualcomm MSM8960 dual-core CPU paired with 2GB of RAM and a 4.2-inch screen. Its dark, monochrome exterior is broken up only by a mirrored BlackBerry logo beneath the display, the chromed BlackBerry emblem on the back and a few matte-aluminum buttons around the rim. It’s an appearance that from the front, it must be said, looks like the iPhone 5. On the right is the three-way volume rocker. Discrete buttons allow you to raise or lower volume, while a third button in the middle acts as a play / pause button and also toggles BlackBerry’s new Siri-like Voice Control. The Menu button is gone and there’s no physical camera button this time around, either, but the volume buttons can be used as such if you don’t feel like tapping on the screen. The public and BlackBerry may put much expectation on Z10. It seems BlackBerry hope Z10 can bring a new and better situation. That’s not to say that the company will be worse or diappear if the Z10 – and the BlackBerry 10 OS that it contains – is not a mass-market success. And this phone is not good enough to gain buyers from Samsung Galaxy series or iPhone or any of the other platforms. It is still hard to be that as Android and iOS are still top in the smartphone market. Step 1. Choose your DVD drive as "Source" and choose open method. 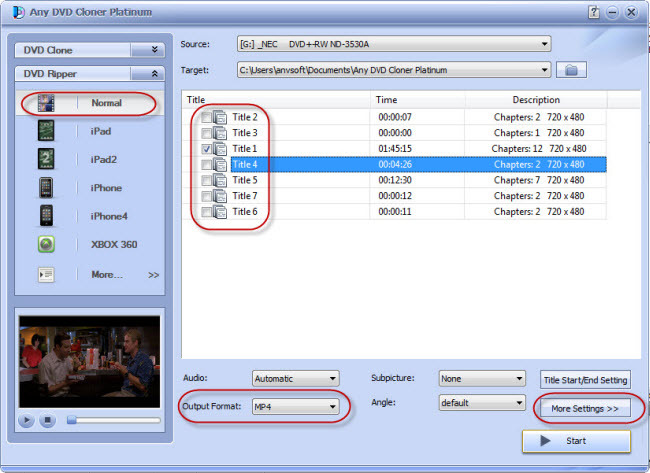 Click button to load DVD titles in the program: chapters, time, titles and the frame size will be listed in order. Step 2. As MP4 is the most widely used video format. No doubt that BlackBerry Z10 would support MP4, too. Here we choose "Normal" and "MP4" will be selected as output video format. Users could choose this option for almost all portable devices in the market. Step 3. 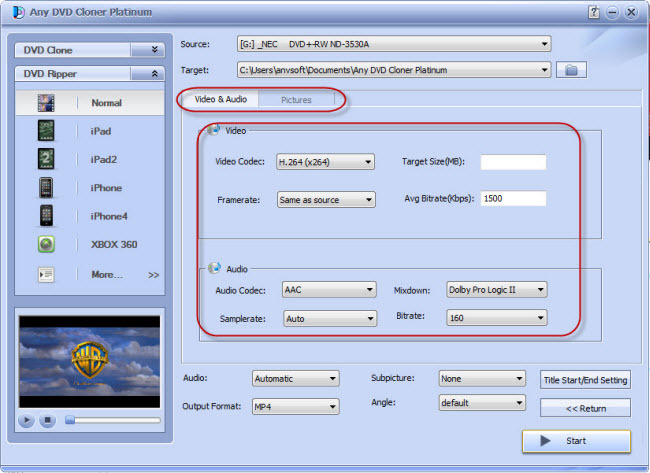 Wanna edit output video parameters for video, audio or picture up to your references for a perfect video playable on BlackBerry Z10? No problem. Click "More Settings" and you can edit frame size, bitrate, video codec, etc. Tips: use a media player software to play the original DVD and right click on the screen, easy to see the DVD properties; meanwhile, confirm the supported video playback technical details of BlackBerry Z10, both can help you to make perfect video output from original DVD discs. Step 4. Click to start conversion. Wait for a while the conversion would complete and just need to transfer the video file from target folder to target device - BlackBerry Z10. Enjoy the movie with BlackBerry Z10 freely and have fun!